Welcome to the matrix code wars! Have you seen these before? They seem to be appearing all over the place! You may have seen them in magazines, on websites, posters and mobile screens. They are all matrix codes (or 2 dimensional barcodes) – and they may just be another tool in your mobile marketing toolkit. A EZcode is a matrix code (or two-dimensional bar code)…that was created and designed specifically for mobile camera phones because of its simplicity compared to other matrix codes. Analytics. Analytics. Analytics. – When you create EZcodes at ScanLife.com and the codes are scanned with the ScanLife app, ScanBuy provides you with data and analytics (e.g. gender, age, household income, zip code, smart phone model, mobile carrier, number of scans and date scanned). If you use a free QR code generator on the web, you don’t get analytics. Clients – and their Agencies – need data to help evaluate campaigns. (ScanBuy also includes data and analytics for QR and Datamatrix codes created at ScanLife.com and scanned with the ScanBuy app.) Any code created by ScanLife and scanned by the ScanLife app will generate “most data 100 percent of the time; and income and zip date about 10-15% of the time,” according to a representative of ScanBuy. Size Matters – EZcodes can be as small as a dime. “Typically QR codes are anywhere from 2x the size of an EZcode to 10x the size of an EZcode, but the QR codes that [ScanLife] generate can always be a minimum of 1 inch,” according to a representative of ScanBuy. 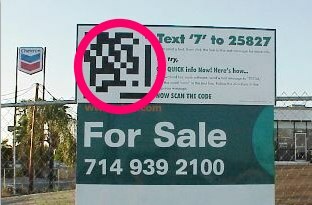 Typically, QR codes that are not generated by ScanLife, are larger because the information is include in the code itself (rather than the EZcode that “points to” a database for the content or call-to-action). Using an EZcode scan code leaves more room in print media to use for something else. “The size of an EZcode does not increase based on the information which it is linked to, while other formats are directly proportional to the amount of data delivered [except when generated by ScanLife],” says a ScanLife in its “EZcode Benefits” brochure. EZcodes Are Easier To Scan On A Smart Phone – the simplicity of an EZcode density design make it easier to scan. While EZcodes and QR codes may be equally easy to scan in a magazine, that’s not true of outdoor boards, clothing and other uses. EZcodes Are Faster To Scan On A Smart Phone – the simplicity of an EZcode also make it faster to scan. Seconds count to get the call-to-action completed. EZcodes Are Easier to Reproduce – the simplicity of the EZcode design means it’s easier to reproduce – even as small as the size of a dime, for example. 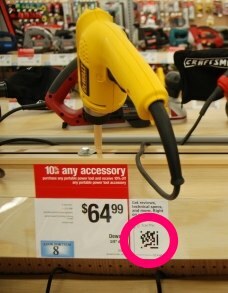 If you make a QR code the size of a dime, it’s likely that the QR scan code will not scan! No One Ever Gets Fired For Buying From IBM – You’re in great company with EZcodes. Major marketers using EZcodes include: McDonalds, American Airlines, Sears, CitySearch, US Air Force, Case Western University, Sprint, Guinness, Billboard magazine, Morgans Hotel Group, and Car and Driver magazine. Pre-Built Scan Code Tools – With EZcodes, in addition to launching a webpage, you can (easily) create a tweet; run a sweepstakes; automatically initiate a pre-determined phone number; send a text message; automatically open a message with the address and text fields pre-filled; launch a carrier specific menu; send all basic contact information to the address book;automatically save a calendar entry (and more). EZcodes Are Smart (Change Info – Even After The Code Has Been Published) – You can print an EZcode scan code in a magazine without knowing the info that you will associate with that EZcode. Plus, even after the scan code is in use, you can tweak your content. So how can you use these codes? By publishing these little images (on your blog, website, print material etc.) your customers can use their mobile phones to scan the images. They will then be directed to the URL of your choice (including a specific website, facebook page, and so much more!) Let us know how YOU might use it, or if you are already using it – how effective is it as a marketing tool? 28. I’m not sure where you’re getting your info, but great topic. I needs to spend some time learning more or understanding more. Thanks for fantastic info I was looking for this information for my mission.